In print and online, Sound & Communications’ Blue Book has been the starting point for industry professionals to find products and suppliers. Filled with useful company and event information, this annual addition to our monthly publication is an invaluable industry resource. 41 product categories for easy reference. Extended company information, including product lines offered, key personnel, district offices or reps, email, web address and more. A trade name index for connecting a brand to a manufacturer. More than 40 trade associations and their contact information. A calendar of trade shows and events from 2016 and 2017. An online edition with great searchable and sortable features. The industry standard print edition that all Sound & Communications’ subscribers receive with their print subscription. 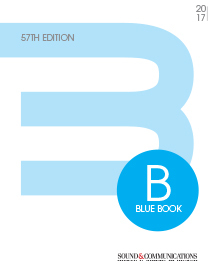 Put the scope of Blue Book to work for you!